Three clubs from Cowley College’s main campus in Arkansas City are assisting with the Labyrinth of Terror in Winfield, KS. The clubs will receive a portion of the $12 admission fee. The three clubs involved are the Diverse Tigers Club, Creative Claws and Media Club. 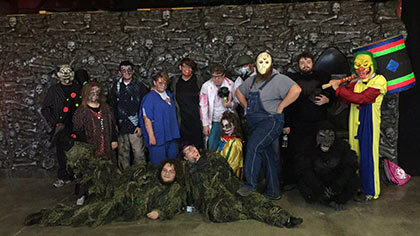 The clubs invite students, staff, faculty, administrators and friends of the college to attend the all new Labyrinth of Terror located at building 10 at the Winfield Fairgrounds. The Labyrinth of Terror is open 7-11 p.m. on October 14, 15, 21, 22, and 27-31. Some proceeds will be donated to other philanthropic organizations in Cowley County.